Although smaller than Mallorca and Menorca, Ibiza is no less impressive with a wealth of history and truly stunning scenery. The landscape constantly changes with rolling, densely wooded hills sweeping gloriously down spectacular green valleys to rich agricultural plains. The island is steeped in history, having been invaded by many different civilisations, each leaving their own indelible mark. Nowadays it attracts more discerning visitors including film stars, artists, writers and musicians all drawn by Ibiza's natural beauty, the laid back attitude of the Ibicenans and of course the style and splendour of the island's capital, Ibiza Town. Apart from the many pretty little beach resorts, all along Ibiza's rugged coast are tiny inlets, sandy coves and superb beaches backed by craggy cliffs and often almost devoid of other people. Ibiza has long been a favourite of tourists and has gained a reputation and its popularity due mainly to the boisterous yet fun, tailor-made resort of Sant Antoni which many people wrongly think is representative of the whole island. 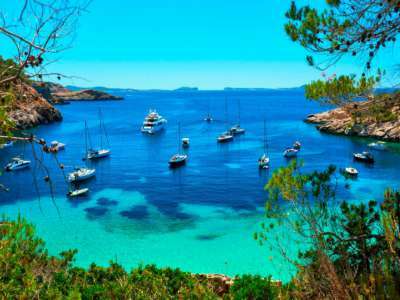 On Ibiza, Sant Antoni is definitely a 'one off' and away from there, an island paradise waits to be explored. 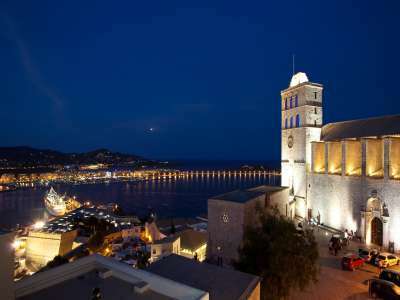 Ibiza Town is the island's capital and one of the most beautiful towns in the Mediterranean. The Old City entirely encircled by its medieval walls and dominated by the Cathedral, towers over the lower town, port and marina, where there are hundreds of restaurants, bars and incredibly fashionable shops. In the evening the whole town comes alive. In the late sixties, the hippies came to Ibizia, many of them settling here and they now provide one of the island's most popular attractions with the open-air "Hippy" craft market at Es Cana. Boasting such mild air and water temperatures, Ibiza is a great place for water-sports enthusiasts, divers, tennis players, aspiring golfers, mountain bikers, etc. There are even facilities for riding, paragliding and go-kart racing. Superb Portfolio of Four Sea View Hotels in Ibiza with in excess of 800 guest bedrooms, restaurants, bars etc. Superb Villa for Sale with Staff Apartment, Pool, Tennis Court and Sea Views.